TVs have, for the most part, been designed to neatly fit set-top boxes underneath. When it comes to headsets meanwhile, things can start to look messy very quickly. Enter Numskull, who has produced an officially-licensed stand for Sony’s PlayStation VR headset. This isn’t the first stand we’ve seen. Back in October BD&A produced a stand that would not only show off the PSVR headset, but would also charge a Dualshock 4 controller and two Move Controllers. Numskull’s stand might not have charging capabilities, but does appear to be much more premium. It’s got a heavy chrome base to keep your headset secure, and a little cable strap to tidy away its mess of cables. Less useful is the official PlayStation branding, and adjustable height mechanism, but we’ll take it if it’s going. 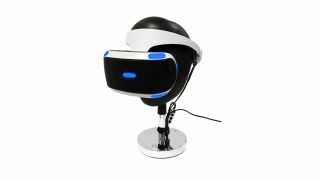 Regardless if you’ve been looking for a stand to tidy away your virtual reality hardware, this might be the stand for you.